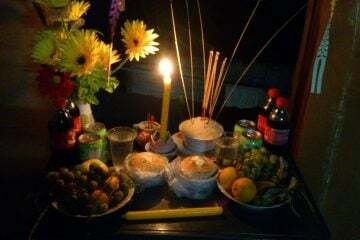 Like most of countries in the world, Cambodian people also believe in things which doesn’t relate to each other and it’s what we call a Superstition. Cambodia is one of the most superstitious nation in Asia, we believe in many superstition, but here are some of them which are known throughout the country. If you dream about snake, your ideal person is coming soon. If you and your friend smell the same flower one after another, both of you will share your future husband in some way. If you sing while you are cooking, you will marry a widow or widower. Cambodian men and women usually count the sound of the gecko crying in order to check out about their future husband or wife. If you are a girl, you will start counting it by saying “Bachelor” at the first sound of the gecko and say “ Widower “ at the second sound. If you end up with bachelor, your future husband will have been a bachelor man before he marry you, and if you end up with widower, your will marry a widower. Some Cambodian people would not eat Trey Dom Rey ( one kind of fish), because they believe that Fish was a pity mother who died and born again as a fish in order to look after her daughter who was oppressed by the step-mother. (but some of us eat the fish).